Here’s one for grj to nitpick. Where do I start! Clearly they are in very warm water since they aren’t wearing wet/dry suits – not even a pair of shorts. Must be the Naturist Invisibulean Sub Aqua Club. Anyway there is no such thing as a Lookout Shark, unless it is specific to their region. 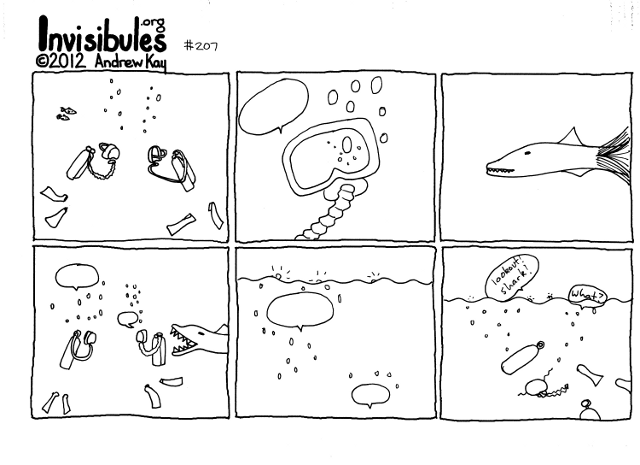 Oh and I know people who manage to talk to each other underwater despite having a regulator in their mouth. So this problem could easily have been avoided. I suppose being invisibule makes it difficult to use any hand signals underwater (especially when it is this warm and gloves aren’t needed). Tempting to say something about the refractive index of an invisibulean as well – clearly they displace a volume of water. Also they must be very heavy since they don’t wear weight belts. I suppose that at least nits are less dangerous than sharks. In most circumstances. Have you not seen the Arctic Ice Pick Nits? They are a terrible curse!